The task brides have in choosing a wedding photographer in Edinburgh is huge. There are as many different styles out there as there are photographers. This said, the selection process need not be a nightmare and browsing online portfolios is a good place to begin. This is a very popular search method, mainly because you are able to view objectively the many different photographic styles without pressure and in the process formulate an idea of what they are looking for before making a choice, it is also a great opportunity to narrow a search and make a short list of potential photographers. Arranging meetings with the photographers on a shortlist offers you an opportunity to examine and compare the quality of image prints and albums on offer and ask questions regarding your wedding album and the general and or specific logistics of your special day. Moreover many couples find that meeting with an experienced professional wedding photographer can be extremely informative, giving an insight into the process of producing the best representation of their wedding. 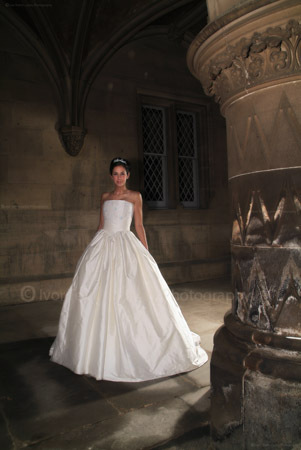 Designer wedding dress bridal photography under the fabulous architectural cover at Fettes College. An eye for detail with regard to interior and architectural photography, lighting and composition is essential to produce spectacular bride and groom, family and group portraits, as are good people management skills. Discretion and sensitivity are the personal qualities which bring about the best candid wedding documentation shots and on the big day these will be the things that count towards guaranteeing fabulous wedding memories. With many years professional experience as an Edinburgh wedding photographer, photographing wedding celebrations in venues throughout Scotland from intimate marquees and country estates to breathtaking Scottish castles, I can offer you exceptional quality reportage and traditional wedding photography tailored to your vision. You can experience our photography with a complimentary engagement photograph session in advance of your wedding date, this is the perfect opportunity for us to get to know each other and practice ideas that will help your day run smoothly, it can often help you overcome any nerves you may have, boosting your confidence. Lighting can create mood and atmosphere to your album images. Photographers use lighting to create many different moods. A professional wedding photographer possesses the skills to "see" and apply techniques that harness available light, control exposure values, compose and arrange beautiful and complimentary photographs, whilst communicating with the couple helping them to relax. The Contre-Jour photography wedding picture of Alice and David is a perfect example illustrating the rich glow produced using a gold reflector, throwing light on the faces and highlighting details in Alice's dress. The following photograph shows how the intensity of the sunlight is softened as it is filtered through the leaves, creating a romantic atmosphere by showering the couple in dappled light. Great care and attention to detail was used in composing this visual, the placement of the faces, the bouquet, and Alice's ring, casting them in a pool of light. Strong sunlight can also be softened with the bride lifting her, creating a classic wedding image. In the last photograph we have the stone pillars and doorway framing an intimate wedding day kiss. 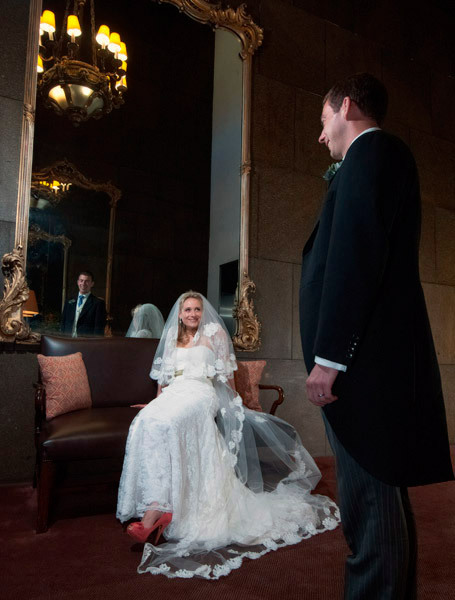 As with all aspects of professional photography, wedding photos require all the attributes that make an image great.